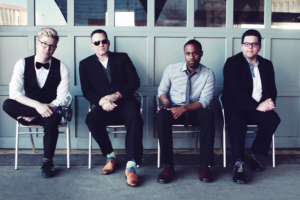 Tonic Sol-fa has established itself not only as the most in-demand vocal group in the Midwest, but also one of the most successful independent acts in America. In addition to substantial album sales of its own independent releases (2,000,000 copies sold), the group has toured extensively throughout the US and abroad, building their financial base with a steady list of festivals and private shows that eventually led to numerous sold-out tours of theaters and small arenas.Tonic Sol-fa began at St. John’s University in Central Minnesota and includes lead vocalist Shaun Johnson, tenor and vocal percussionist, Greg Bannwarth, baritone and percussionist/vocal percussionist, Theo Brown, and bass, Jared Dove. Together the group reached national prominence with appearances on NBC’s Today Show and in Newsweek magazine. Along the way, they shared the stage with a number of recognizable performers including Jay Leno, Jeff Foxworthy and Weird Al Yankovic, and were recently inducted in the Minnesota Music Hall of Fame alongside Prince.From the group’s onset, the members have overseen and operated the business of Tonic Sol-fa with a only a small team of driven supporters acting as managers, lawyers, and publicists, and increased revenue from a few thousand dollars in their first year to a multi-million dollar limited liability company. The group overcame a number of obstacles, including an unspoken apprehension to a cappella acts by individuals in the music industry and having a name that was anything but catchy (a system of naming the notes of the scale, usually do, re, mi, fa, sol, la, ti, developed to teach singing). Still, the group persevered, recording and manufacturing its own records and selling them to a growing legion of fans via the Internet and social networking sites, in the lobby of the theaters where they performed, and through a growing national distribution. One could say they gained their current consumer popularity the old fashioned way; they earned it.At present, Tonic Sol-fa is putting the finishing touches on an album of requested originals, a collaborative recording in a catalog of numerous award-winning DVD and CD projects highlighting four indelible voices. This outstanding blend has resulted in multiple Contemporary A cappella Recording Awards, NACA (National Association of Collegiate Activities) Entertainer of the Year nominations, considerable national press, and has landed their music on the best-selling seasonal DVD at Wal-Mart, The 12 Dogs of Christmas.Further Tonic Sol-fa has released three television specials, which have aired over 1800 times in forty-seven states and Canada. The new PBS special will be shown through 2018, continuing to spread Tonic Sol-fa’s unique sound to an ever-growing audience.Tonic Sol-fa continues to tour, record, and conscientiously run their business in the only way familiar to them – differently.